This March, the Plastics are back and Fetch is so happening! Tina Fey’s iconic Mean Girls is now available on Netflix and we couldn’t be more psyched. Also, Tina Fey has teamed up with her 30 Rock showrunner Robert Carlock to create a Netflix Original titled Unbreakable Kimmy Schmidt. This comedy is just the cherry on the March cake. So while you’re enjoying March break with a little movie madness, here’s what’s kind of a big deal. Tina Fey’s Unbreakable Kimmy Schmidt (March 6) brings Ellie Kemper as the leading lady (you might remember her from Bridesmaids, 21 Jump Street etc.) who plays a 30-year-old woman who has finally been rescued after living in a cult for 15 years. You will share a few laughs with her as the headstrong and extremely funny actress makes her way through New York City. Another original that we can’t wait to watch is the riveting thriller Bloodline (Mar. 20) starring Kyle Chandler and Ben Mendelsohn. Fans of comedy will get to enjoy Aziz Ansari: Live at Madison Square Garden (Mar. 6). Two other originals swimming around are the Trailer Park Boys: Season 9 and My Own Man. Girls Night just got a whole lot better with Sabrina (Mar. 1) for company. You can also enjoy mojitos while Paul Rudd and Leslie Mann entertain you in This is 40 (Mar. 1). Side Effects (Mar. 21) and A Different World: Complete Series (Mar. 15) are also on the chart for picks. We feel ya! Clint Eastwood directs and stars in Gran Torino (Mar. 1). If this iron-willed actor doesn’t get to you, then the power-packed performances by Marion Cotillard and Joaquin Phoenix in The Immigrant (Mar. 17) will pull at your heartstrings. Frank (Mar. 9) and Harmontown (Mar. 1) are also great options available. Don’t we love a case of mistaken identity? ABC’s hit family show Switched at Birth (Mar. 1) is now available for moms and daughters to feast on. Channing Tatum woos us in She’s the Man (Mar. 1), that’s going to be hard to resist! Dark Skies (Mar. 26) and 3rd Rock from the Sun (Mar. 15) are also slightly different genres but still a good case of mistaken identity. Calling all nerds! X-Men: Days of Future Past (Mar. 1) is finally here to sweep you through time. If that doesn’t satisfy your fill of geek, Transformers: Age of Extinction (Mar. 13) is ready to blow you away with Mark Wahlberg to the rescue. Bleach: Fade to Black, I Call Your Name (Mar. 1) and Revenge of the Nerds 2: Nerds in Paradise (Mar. 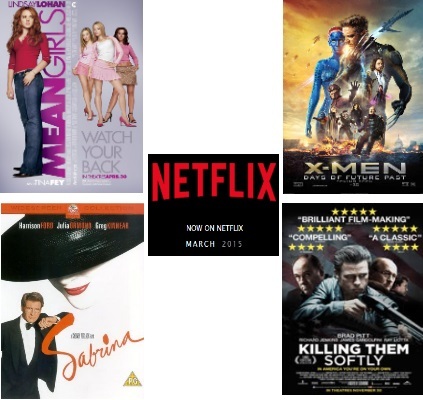 1) are more options to entertain you this March. One name certainly comes to mind with this title: Brad Pitt. This man needs no weapon to destroy his enemies and comes with full force in Killing Them Softly (Mar. 30). End of Watch (Mar. 1), Once Upon a Time in Shanghai (Mar 13) and Justice League: The New Frontier (Mar 1). Come March 1, the kids have lots to be excited about. Oscar-nominated How to Train Your Dragon 2 is all set to take the lil’ ones to a whole new land packed with fierce adventures. Pac-Man and the Ghostly Adventures: Season 2, Scooby-Doo and the Goblin King and The Looney, Looney, Looney Bugs Bunny Movie will make sure these kooky creatures keep them company all March long. As much as we’d love to watch the same movie again on Netflix, eventually, they get replaced with other alternatives. Soak all the revenge before you can as Cruel Intentions will bid farewell on March 30. Mark Wahlberg will dominate in Contraband only until March 20 and Katy Perry: Part of Me will soon be singing her way out on March 18. So catch ’em while you can! X-Men: Days of Future Past (Mar. 1) is not available on Netflix streaming in Canada!